Gulab jamun is a classic Indian sweet made with milk solids, sugar, rose syrup & cardamom powder. 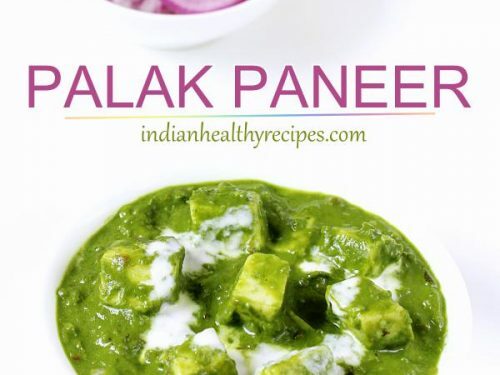 It is very famous & is enjoyed in most festive and celebration meals. Traditionally gulab jamun were made using khoya i.e milk solids as the main ingredient. 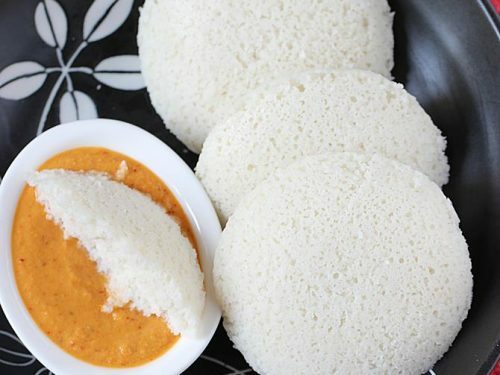 But khoya is not available in many places and is very tedious to make at home. So many people make them with milk powder. 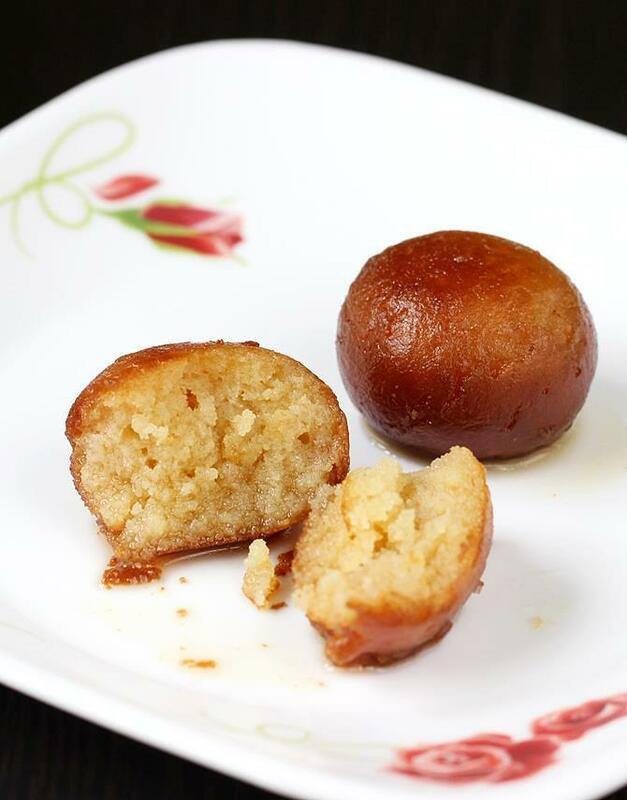 Gulab jamun are soft delicious berry sized balls made of milk solids, flour & a leavening agent. These are soaked in rose flavored sugar syrup & enjoyed. The word “Gulab” translates to rose in hindi & “jamun” to berry. So gulab jamun are berry sized balls dunked in rose flavored sugar syrup. 1. Making gulab jamun with milk powder is for those who do not have access to khoya and do not prefer to toil at home making it for hours. 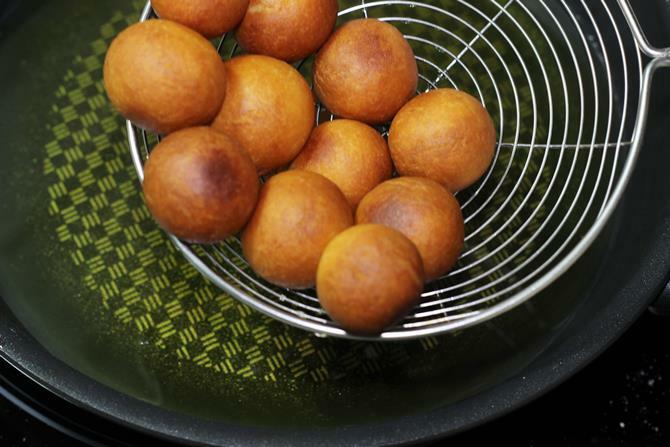 This Gulab jamun recipe using milk powder is good even for beginners to try. I have shown this method in the recipe card & step by step photos. 2. 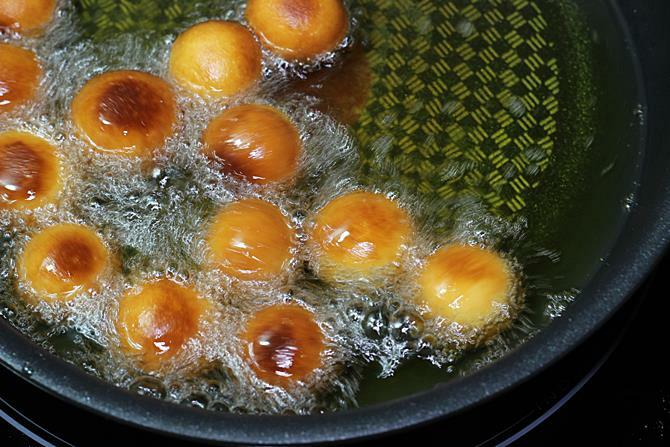 Making gulab jamun with khoya is also easy if you have access to it. 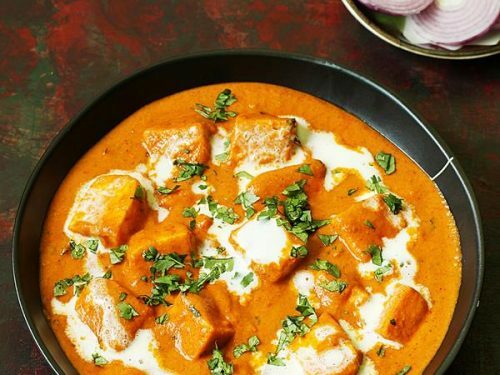 Khoya is also known as mawa and is sold in the frozen sections of the Indian grocery stores. 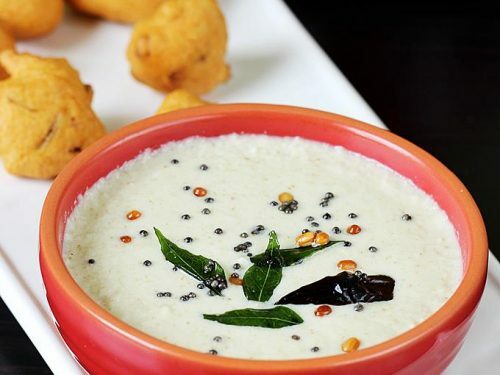 There are different kinds of khoya available, this recipe needs plain unsweetened khoya. It is usually labelled as suitable to make gulab jamun. I have shared this recipe in the video towards the end of the post. For step by step photos you can check this link of Khoya jamun. 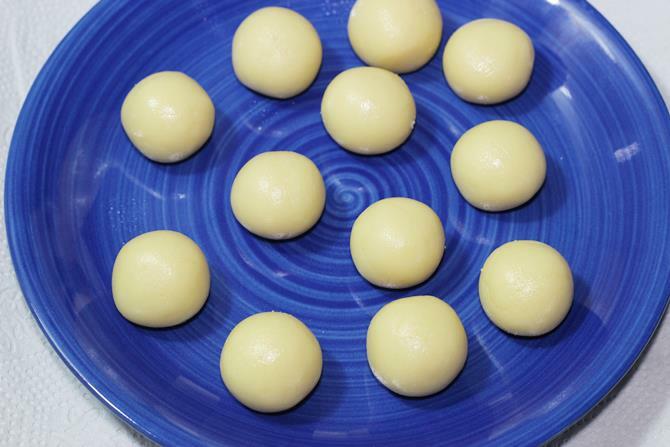 The key to milk powder gulab jamun is using curd/yogurt or lemon juice. 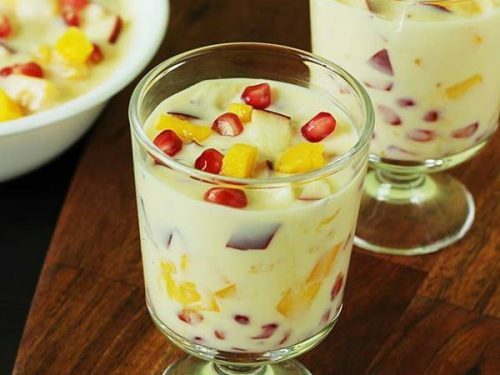 You will not get the taste of curd or lemon juice in the jamuns if it is used in the mentioned quantities. 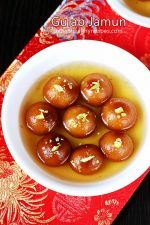 In this gulab jamun recipe, soda reacts with the yogurt or lemon juice and then makes the dough light. So we get light and soft jamuns. I highly suggest not to alter the recipe as it may not work. After several trial I got these right, just the way one would get in North Indian restaurants and sweet stalls. Soft, juicy, mouth melting and delicious. Please note that this gulab jamun recipe may not work with low fat milk powder. I have used everyday regular milk powder from Nestle. 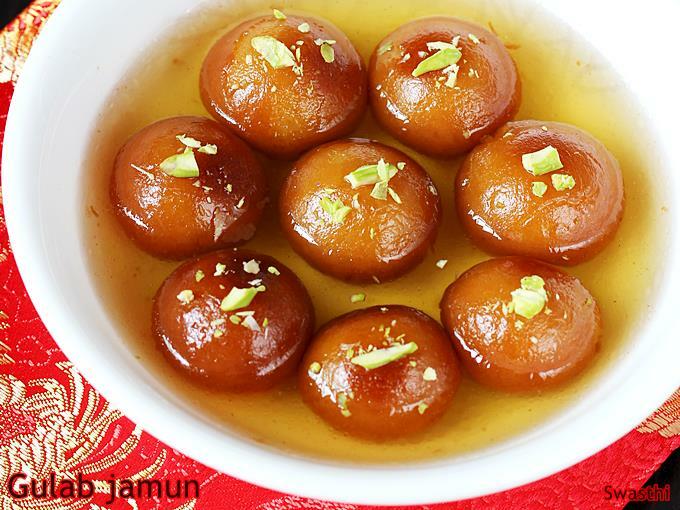 Gulab jamuns are often made during festivals like Eid, holi, diwali & navratri. 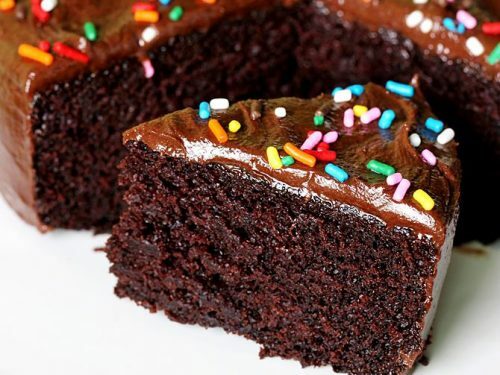 If you are making these for a special occasion, then I suggest you halve the recipe and try first. Once you get to know the trick of making the dough correctly then you can easily double or triple the recipe. Gulab jamun are a popular classic Indian sweet made of milk solids and sugar. 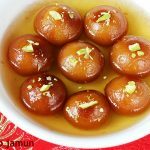 This post shares 2 gulab jamun recipes. one with milk powder and the other with khoya. 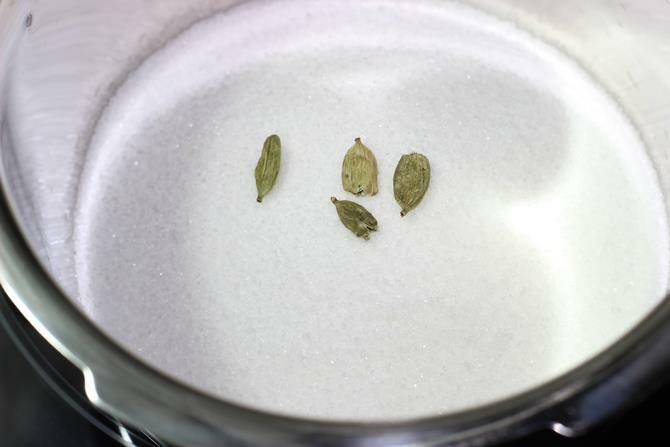 Mix together water, sugar and crushed cardamoms in a pot. Boil the syrup until it turns slightly sticky. Turn off the stove before it goes to a 1 string consistency. If it reaches a 1 string consistency, then add 2 tbsp of water and mix. Add rose water and mix. Set aside to keep it hot. 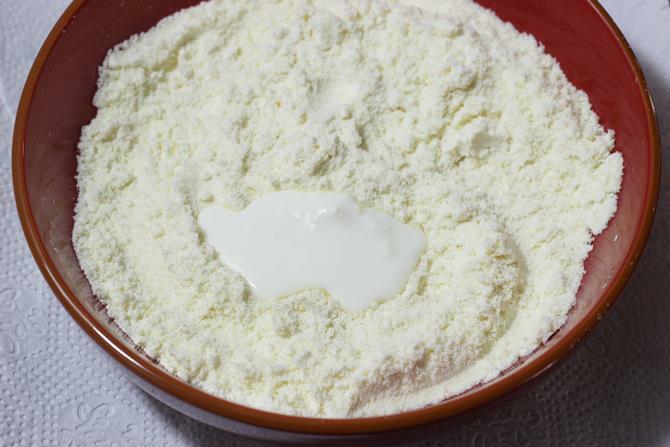 Fluff up the flour in the jar with a fork and then measure correctly. 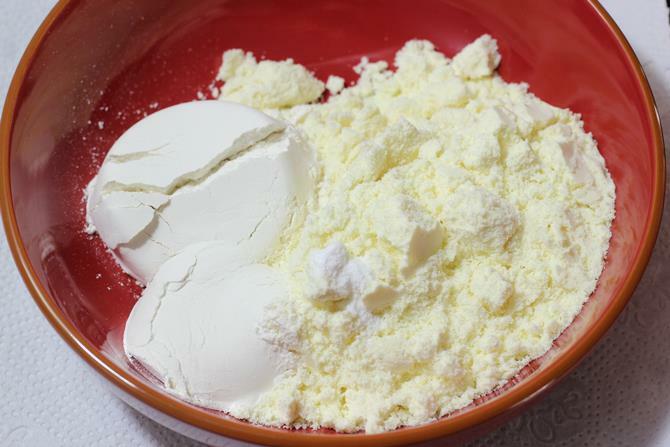 Mix together flour, milk powder and soda in a bowl. Either sieve it or mix uniformly. Add ghee to it. Mix well. 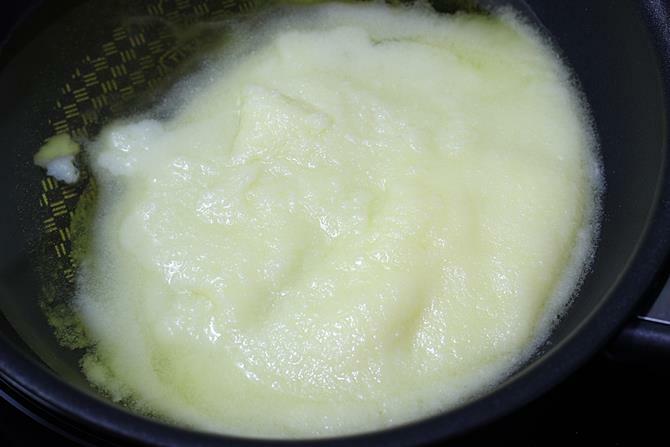 In a small bowl, mix together lemon juice or yogurt and 2 tbsp milk. Pour 1.5 tbsp of this to the flour mixture. 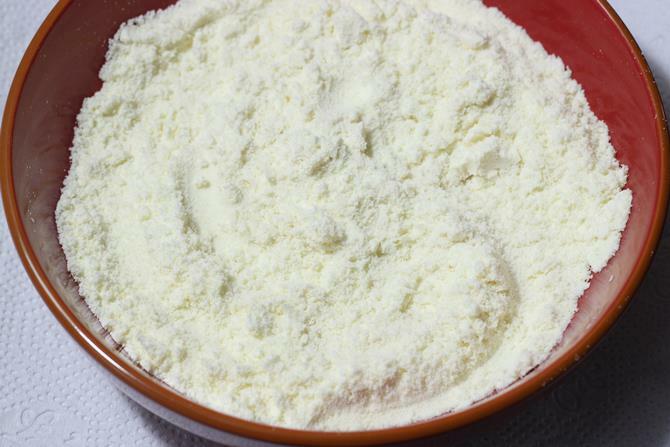 Begin to bring the flour together to make a dough. If the dough is too dry, add little more milk & curd. Do not add a lot. Use only as needed. The dough turns sticky. Grease your fingers and make a ball. The dough must not be soggy. It must hold the shape well. Divide to 14 to 18 equal sized portions. Grease your hands and roll to smooth balls. They must be smooth without any cracks or lines otherwise you will find many cracks on the gulab jamuns. Keep them covered. Heat up the pan with ghee or oil on a medium heat. Also check if the syrup is hot. If it is not hot, heat it up a bit. It must be hot and not very hot. When the ghee is just medium hot, add the balls. 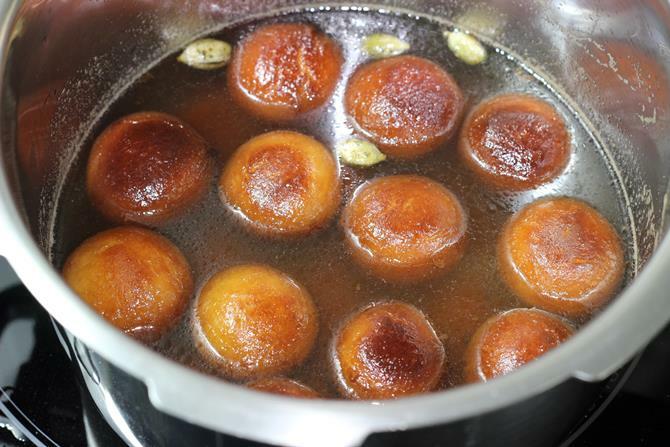 Make sure the oil is not very hot else the gulab jamuns will brown without cooking well. To check the right temp, you can drop a small piece of dough in the oil. It must rise slowly without changing its color. 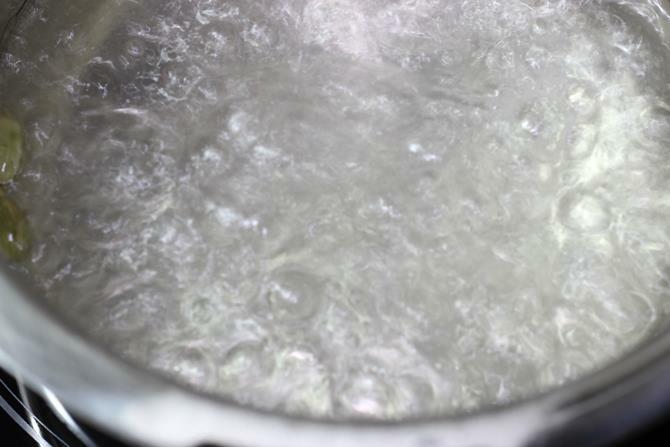 If it rises rapidly then you will need to cool the oil a bit before frying. Fry the balls on a medium flame until golden. 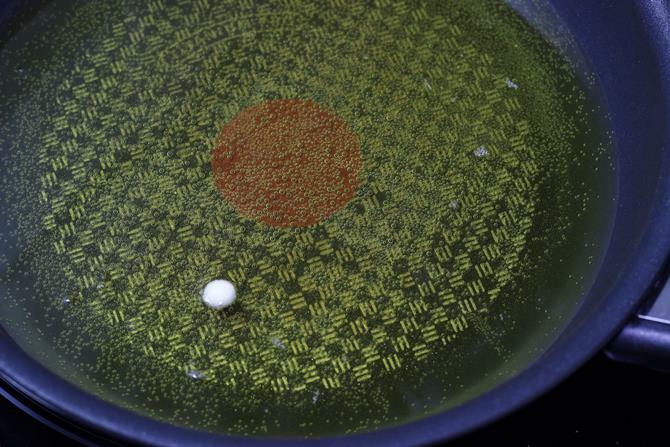 Keep stirring gently to fry them uniformly. Add them to the hot syrup. Allow them to rest for 3 hours and serve. Garnish gulab jamun with chopped pistachios. Please use correct measuring spoons and cups. This recipe will not work with approximations. The recipe will not work without baking soda. Check the expiry of the baking soda before using. If you are trying the recipe for the first time, you can halve the recipe and try. The amount of milk & curd mentioned in the recipe may or may not be sufficient. It depends on the milk powder used. If the dough turns dry, then use little more milk. This recipe may not work with low fat milk powder. Addition of even little more soda may disintegrate the jamuns while frying or while soaking in syrup. Frying the balls on a very low flame will make them hard. You can find the ingredients in the video. 1. 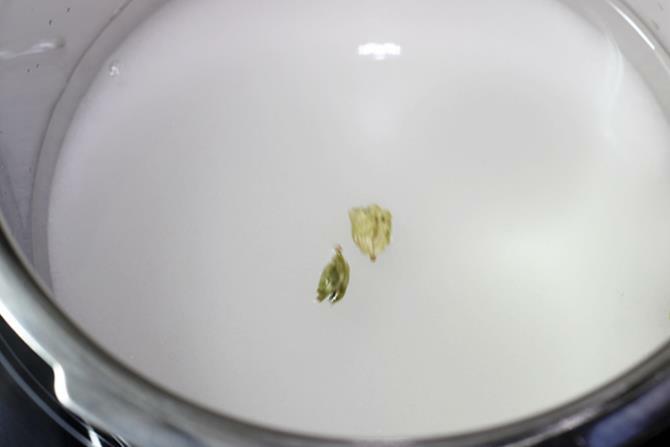 Add 1.5 cups sugar and lightly crushed 4 green cardamoms to a pot. You can also use organic or turbinado sugar, the color of the syrup will be darker. 2. Pour 1.5 cups water. 3. Boil this until the syrup turns slightly sticky. To check this, cool little syrup in a small plate. Dip your fore finger in it and touch with your thumb. You should feel it is slightly sticky. 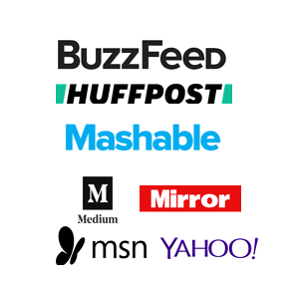 It should not reach one string consistency. If you fail to make the syrup correctly, then the jamuns will not soak the syrup and turn soft. If you go past the sticky syrup stage, you will end up in a one string consistency. In that case, add little water and stir. Check again. Switch off. Add rose water. 4. 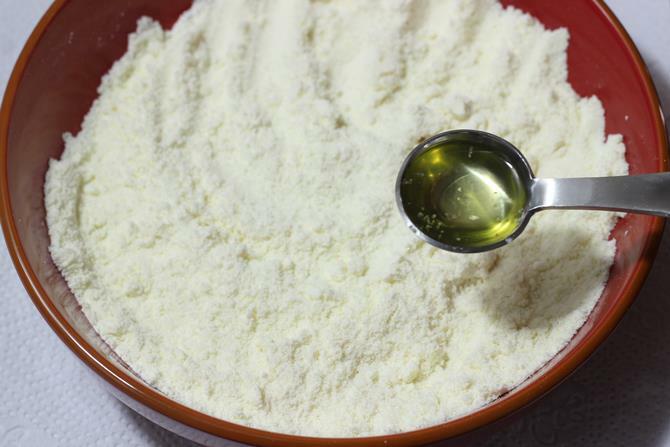 Measure 1 cup milk powder, ¼ cup +1 tbsps all purpose flour or maida and then a large pinch of soda. If you use more soda then the balls may break. 5. Then mix them up very well or sieve it. Make sure the mixture is uniform. Add 1 tsp of ghee. 6. Next mix well everything. 7. 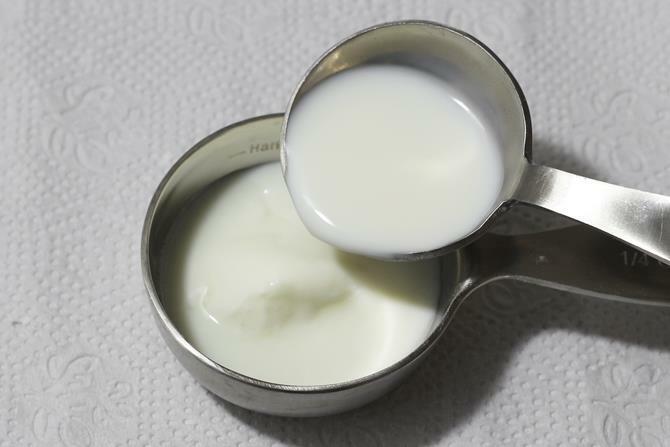 Take 1 tbsp of yogurt or ¾ tbsp lemon juice and 2 tbsp of milk. Mix both together. 8. Pour 1.5 tbsp of this to the flour. Begin to mix. Use up the rest as needed. I used up full 2 tbsp of it. Do not knead the dough. If the dough is too dry use little more milk. 9. The dough turns slightly sticky and refuses to leave the fingers. Grease your fingers and make a stiff yet soft dough. This should be the right consistency of the dough. If by chance it turns sticky sprinkle another tsp of plain flour. This is just to fix and does alter the texture. 10. 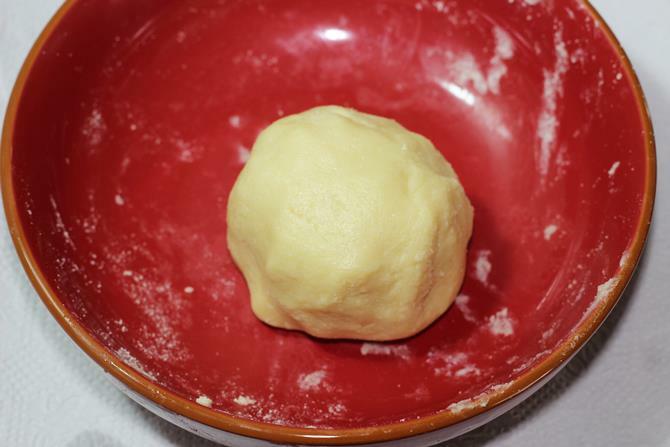 Divide the dough to 14 to 18 equal portions and make smooth balls without any lines or cracks on them. Do not knead or press the balls. Be gentle in handling the dough. Check your syrup if it is still hot. If not, heat it up once more. The syrup must be hot and not very hot. When you dip your finger, you must feel it is hot. But not very hot that you cannot tolerate the heat. Leave it on the stove. 11. Pour ghee or oil to a hot pan. I prefer ghee to oil since ghee has a better smoke point than oil. 12. Ghee or oil must be just medium hot and not very hot. Else the gulab jamun will brown without cooking inside. To check the correct temperature, add a small piece of the dough to the oil. The ball must rise slowly without changing its color much. This is the right temperature. If the ball rises fast, then it means the temperate is a bit high. Then take off from the stove for a while. 13. Add the balls gently and fry them. I added all of them at one time. But be sure not to crowd them. While frying they will increase in size, so provide them enough space in the pan. 14. 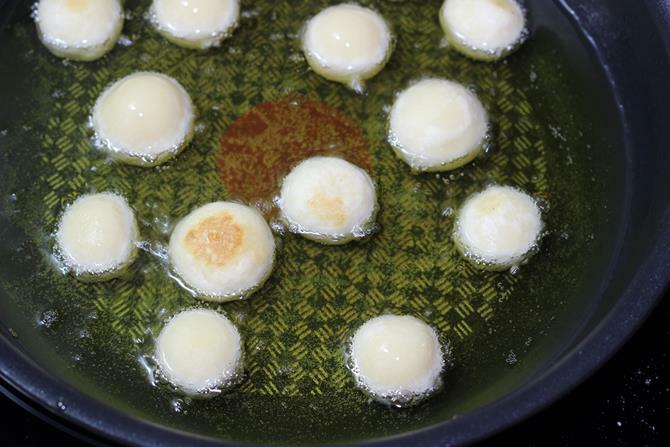 Keep stirring gently to fry them evenly. Since I used a flat pan, I tilted my pan slightly and fried to give them a even color. 15. When they turn golden, take them off the pan using a deep fry skimmer or a strainer. Drain them very well. 16. Add them directly to the hot sugar syrup. Do not dunk them with oil dripping. The sugar syrup must be hot, not very hot or steaming hot. Garnish with chopped pistachios and serve after 3 hours. Pic of soft gulab jamun after 5 hours of soaking.